College can feel a little crazy at times with so many responsibilities, so you may want to relax in your dorm room at times. Your Full size dorm bed will most likely be the comfiest part of your dorm room, but that's only if you add the right college bedding items. Comfortable Full bedding items are an essential part of your college dorm room, so let's start with the basics. Every Full dorm bed is going to need some extra cozy college sheets, and we have a great Full sheet set for you! 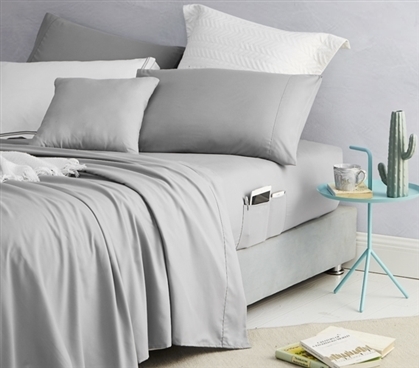 Our low cost Bedside Pocket Full Sheet Set - Supersoft Alloy comes with a fitted Full sheet, a Full oversized flat sheet, and (2) matching pillow cases, all covered with the same incredibly soft microfiber material. These comfy Full bedding pieces will help you relax on your dorm bed when you need to take a little break. These one-of-a-kind Full sheets will also help you with the overall appearance of your dorm room. Gray dorm bedding is easy to match, creating a cohesive look between your Full size bed and your college decor. So this Full sheet set is comfortable and stylish, a great combo for your dorm room, but that isn't all! In your dorm room you might not have room for a nightstand or any other type of college furniture to keep your personal belongings within reach when you're laying on your Full sized bed. The unique fitted Full sheet of this Full college bedding set features two pockets on either side, so you're dorm essentials can be easily accessible!